Singapore - Recognised as one of the 'caring' professions, teaching, and in particular the early childhood sector, has long been dominated by females within the workplace. As natural nurturers, biologically wired to multitask, early childhood education (ECE) not surprisingly attracts high numbers of women. And for teachers who are mothers, school hours and holidays tend to suit the traditional role of working women within Singaporean households. Though still very far from becoming a profession of gender balance, we are slowly witnessing a rise in the number of males entering the early childhood sector. This is apparent in the number of male preschool teachers employed in Singapore today, compared to just a decade ago, as well as the number of students taking up early childhood diplomas and degrees. At Julia Gabriel Education, which includes Chiltern House Preschool, Chengzhu Mandarin Centre and Chengzhu Mandarin Kindergarten, as well as Julia Gabriel Centre, we now have 10 male teachers compared to just two when we opened the doors of our first Julia Gabriel Centre 28 years ago. In conjunction with the typical longevity of our employees across the board, 5 out of 10 male teachers have been with us for more than 10 years and 2 out of 10 have completed between 3 to 10 years of service. Within the last 3 years, we have recruited 3 male teachers. Happily, this appears to be a growing trend across the early childhood sector as a whole, for a number of reasons. Gender boundaries have become more fluid in recent years as school leavers and millennials (those currently aged between 20 and 35 years old) adopt a more relaxed approach to gender roles than earlier generations. Less concerned with traditional social constructs young males feel more comfortable to pursue their passions and take on what are considered to be traditionally female roles. We are also seeing men switch mid-career from a variety of professions to teacher training. Added to that, Singapore’s government and early childhood sector has come to the realisation that ruling out men as preschool teachers severely narrows a much needed talent pool. Change does not take place over night of course, but the dynamics are balancing out. It is now more widely recognised that gender diversity adds value to a workforce, particularly where children are concerned. Male teachers provide an alternative and important role model to female teachers. Ideally, we want all our children, both boys and girls, to develop confidently with strong role models of both sexes. However, in Singapore today, it is still the norm that fathers are the primary wage earners. In many cases, fathers may be absent for extended periods of time due to work and travel commitments. The value of a committed, caring and strong male role model during the early years should not be underestimated; a role that can be supported and in some cases filled by a dedicated, caring and qualified teacher. It is important to continue to encourage more men to join the early childhood sector. There are always steps that can be put in place to ensure a supportive psychological and social environment for men likely to be in the minority in a workplace and to recognise their contribution, just as we should women; and to communicate this in the recruitment process. The key however, as with most things, is to start at the beginning and avoid the stereotypical pit falls when children are young. No profession should be out of bounds to both genders. Girls can code and be astronauts, footballers and fire-women. Boys can be nurses, house-husbands and preschool teachers. And it is our responsibility to communicate to and encourage our children that whatever their choice, it is relevant - and possible! At Julia Gabriel Education, our male teachers have always been very popular with children, parents and colleagues. We have never felt it necessary to accommodate them in a different way; rather we encourage our male teachers to grow through professional development in order to make a more impactful contribution to education. That said, there are challenges when attracting men to become early childhood educators. There is still a social stigma surrounding the reasons why a man chooses to work with children. Absurd, considering men are fathers! Yet, the fact is that many parents of young children are wary of male teachers. Society has to overcome the idea that if a man is a preschool teacher then he must be a sexual predator; a factor that no doubt puts off a lot of men from joining the profession because of the judgment they may face. In order to safeguard our teachers and to assure parents, we enforce a policy across all our centres that male teachers may not be left alone with very young children at any time and that there must always be a female colleague present. Additionally, only female teachers take children to the toilet. 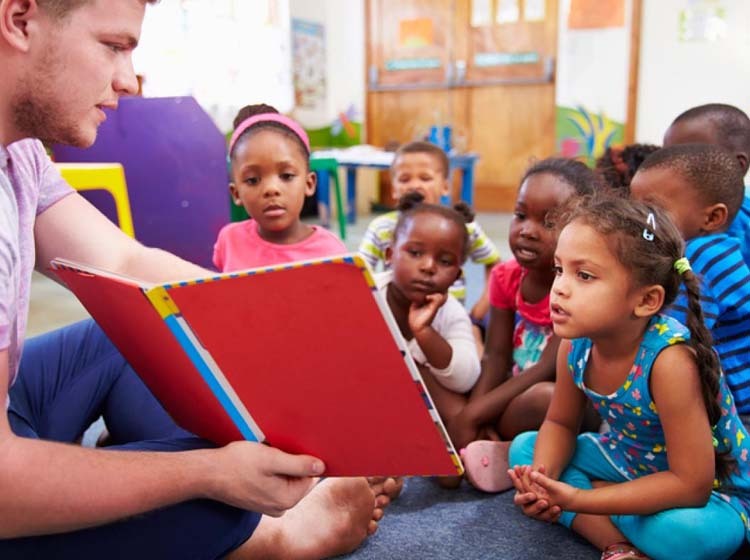 A further challenge to recruiting male early childhood teachers is that undoubtedly there are other professions they can enter that are more lucrative when it comes to pay. And there is, particularly in Asian nations, still a great deal of pressure on males to be the prime bread winner, earning a high salary. That said, it is encouraging to witness the number of male early childhood educators slowly growing. We choose all our educators, whether female or male, for their passion, dedication and unique skills that they can bring to their teaching, in addition to their qualifications and experience. We hire based on merit, not according to gender. Men have always been as important as women within our community, enlivening classes with their unique energy, values and dynamic approach. We are lucky in that the nature of our programmes - fundamentally arts based, including activities such as drama, music, performance and visual media - are equally attractive to males. Throughout our company, we have always embraced diversity and striven to create an inclusive workplace. Gender diversity simply happened naturally. More important than gender, is that prospective teachers demonstrate appropriate skills, passion and an alignment with our company values. If they enjoy and respect children, have a thirst for learning themselves, a desire to connect and make a positive difference in the lives of others, then we are happy to welcome them, regardless of age, race or gender.